It's been nearly four years since I've tracked multi-track drums. My last recording studio simply was not large enough for a drum kit to be set up in, nor was it soundproofed. Now that I've got my new larger recording studio which is pretty well isolated from the outside world I can now record multi-track drums without upsetting my neighbours. What Topics Are Covered In This Tutorial? Why second rack toms should be the first kit piece to remove from the kit if you have minimal inputs on your interface to record with. Drum shell dampening solutions to help you reduce ringing overtones. Kick drum damping to get snappy tight sounding kicks. An introduction to drum tuning using a very cool little device called the Tunebot. Microphone placement techniques on drum shells using Audix dynamic drum microphones. Getting the tone right at the microphone pre. 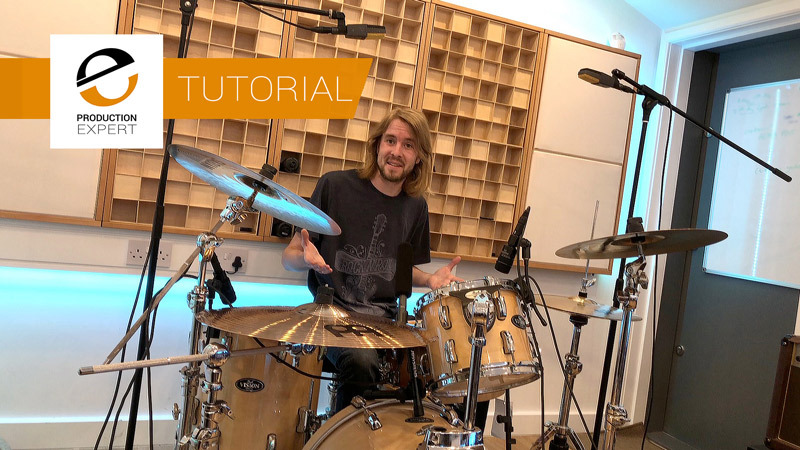 This tutorial includes four audio examples that will give you an idea of how each overhead microphone combination sound. We compare the AKG C414s against the SE X1 Ribbon microphones both straight through a valve microphone pre with high and low filtering and without. How Can I Watch This Video? Firstly you can watch the preview section of this video for free, no charge and with no signup. If you have not yet signed up to the new platform, and you want to watch the rest of this video, and hundreds more like it, then you can by signing up for a free 7-day trial. If you aren't satisfied it is a good deal then cancel the subscription within the 7 day trial period and it won't cost you a penny. If you like it then for just $3.99 per month you can watch this and hundreds more videos like it. If you are already an existing subscriber to our new video platform, then thank you for your support and you will be able to watch this video all the way through. The Neumann U67 Reissue Vs The TLM107 As Mono Overheads - How Much Difference Does A Tube And A Transformer Make To The Sound?